The Ireland manager will return to Glasgow later this month when the Boys in Green take on the Hoops. 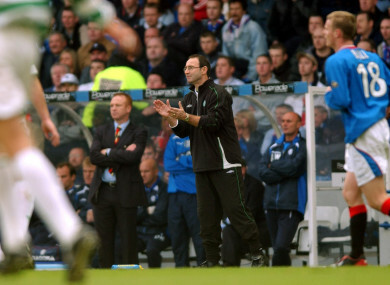 O'Neill managing Celtic in an Old Firm derby at Ibrox back in 2003. MARTIN O’NEILL KNOWS a thing or two about the Old Firm rivalry, having enjoyed five successful years at Celtic. Under current manger Brendan Rodgers, the Hoops secured a seventh successive Scottish Premiership title on Saturday by thrashing the old enemy Rangers 5-0 at Parkhead. Speaking at a ‘Show Racism The Red Card’ event yesterday, the Derry native described the Gers as “dreadful”and he expressed his beliefs in more detail this afternoon. At the launch of the 2018 SportsDirect FAI Summer Soccer Schools, O’Neill suggested it is actually in Celtic’s best interests that Rangers make drastic improvements. “I do think that Rangers are desperately poor,” O’Neill said at the Aviva Stadium earlier today. “I think if Celtic are going to improve in Europe, I believe they need a strong, competitive Rangers to be with them. “That might sound anathema to some Celtic fans who are desperate to go 10 in-a-row, but I genuinely think this. Celtic are the best team in Scotland by a million miles, and Rangers’ competition — as you seen in recent weeks both in the cup semi-final and last week — is desperately weak. Interim manager Graeme Murty was sacked by the Ibrox club today, apparently paving the way for Steven Gerrard to take over. Despite his criticism of Rangers, O’Neill believes the Liverpool legend’s arrival could have a positive impact. “Absolutely, why not?” O’Neill replied, when asked if it could be the right job for Gerrard. “Why shouldn’t he? He knows pressure, he has lived with it and performed brilliantly under pressure as a player. I know playing and managing are two totally different things, but it would be a massive lift for Rangers if someone of that ilk was going there. Ireland’s next international fixture sees them face Celtic at Parkhead on 20 May in a testimonial match for Hoops captain Scott Brown. O’Neill joined the club in 2000 and went on to win three league titles, two Scottish Cups and the Scottish League Cup as well as finishing runners-up to Jose Mourinho’s Porto in 2003. He took charge of them for the final time in a similar game to the upcoming one involving the Boys in Green for Jackie McNamara in 2005. “Wee Jackie was a terrific footballer for us, really good,” O’Neill remembered. “Those were the days. You pass the torch onto someone else and it goes. I have been back to Celtic Park a few times, perhaps not as often as I would have wanted to. But it’s a great, great football club and hopefully when they play us, they will have clinched the double-treble. Ireland also have end-of-season friendlies away to France (28 May) and at home to the US (2 June) scheduled, and several regulars could potentially be missing due to involvement in the Championship play-offs and pre-arranged holidays. “First of all, I will have some players who are going to be involved in play-offs,” said O’Neill. “Secondly, when we’re organising the international matches at the end of the season, the players always know that there will be matches. “But some of the Premier League players might be looking for a little family holiday before we meet up, as the Scott Brown match came a wee bit after some of the lads had organised things. In fairness, they’ve talked about maybe changing plans, but if they have made this little family holiday and that’s the only opportunity they get — because players come back rather quickly now for pre-season — then I would say I’ll allow one or two that time. Email “O'Neill: 'It's the weakest Rangers side I've ever known and Celtic need them to be strong'”. Feedback on “O'Neill: 'It's the weakest Rangers side I've ever known and Celtic need them to be strong'”.